IT was only last year that Zerbin, led by namesake Jason Zerbin, garnered our full attention and immediate approval when local radio began spinning a song destined for national obsession. Zerbin's "New Earth"--conjured up, inked out, and laid down within a ridiculous span of just 30 hours--easily became one of the tracks I hoped to hear while listening to Sonic on the way to work every morning. In the end I buckled down and spent the 99 cents on iTunes. Nick West, Derek Gust, Jeremy Dehek, and Andrew Hochalter. And soon I had to know more about this band, conceived right here in our own backyard. Turns out it was only in 2010 that they launched a prophetic alt-rock debut LP, Of Fools and Gold, 14 tracks that have since earned them various awards and accolades, Top 40 airplay, and even appearances in Degrassi, America's Next Top Model, and the Drew Barrymore film Going the Distance. That's why I decided to give Mr. Zerbin himself a call, just one day before he got hitched(! ), and asked him some quick questions about himself, his band, and their hypnotic sound. Thanks, Jason, for your time! I♥E/ What kinds of bands or singers may have influenced or inspired your own sound? JZ/ Well, my favourite sort of musicians are always ones that somehow connect with the heart, whether it's something that's fun or that's super sentimental, and stuff you can connect with the most. There's some bands you've probably wondered of--like Jason Upton--that we love, to more well-known bands like Coldplay, U2. The sorta thing that creates music that feels transcendent. It's almost like this emotional thing that people can be welcomed into. Those are kind've my big influences. As a band each member kind've has different influences and that brings in the whole sound. I♥E/ That's funny that you mention Coldplay, because that has to do with my next question. I once described your music to a buddy as a kind've "down-to-Earth Coldplay"...is that accurate in your eyes, and would you take that as a compliment? JZ/ A 'down-to-Earth Colplay'. You know what, for several years I didn't even own a Coldplay CD. People have said there's a lot of similarities at times, just with some of the arrangements of the songs and the melodies, and stuff like that. I never wanted to ever be a copy of someone else. We very much wanted to create our own sound, and I think we've been able to do that. I would take that as a compliment, because I think Coldplay is an amazing band, and they write stuff that I really like to listen to. and features 14 tracks, including "New Earth." I♥E/ What do you think of Edmonton's own music community and our support of it? JZ/ I think Edmonton actually has a fantastic music community. I've been amazed in the last 2-3 years getting to know it a lot better, and seeing the amazing amount of talent that's within Edmonton. A lot of it is still not well known, but some of these artists are just amazing songwriters, and I think Edmonton is growing in its ability to highlight the musicians that are here. I think that it's still in the beginning stages of that, but I think the future is really strong, and we've been so honoured in this last year feeling like Edmonton just kind've owned us as a band and supported us. I♥E/ The song "New Earth" is actually one of my favourites songs of the last year. What would you say you wrote it about? JZ/ The story of "New Earth" is: I had to write a song that was to be pitched for a commercial, and they wanted something that was soulful. So I sat down and we had 30 hours from the time that I wrote the song to when we had to have it submitted. So I wrote it and we actually recorded it all night long and finished mixing it the next morning, and had it submitted by like 8AM the next morning. So it was one of these crazy things with no sleep. It was just one of those times when we had to get something done. The picture that I got that kind've came into my mind when I was writing this song--I'm not really an environmentalist, we're not known for that--was this picture of what the Earth was intended to be...like this place of life and beauty and of hope; and people kind of look around the Earth and they see uprisings all over, and crackdowns from government, and abandonment and natural disasters, and people get overwhelmed and stressed out with that. In this book called Revelations there's this picture that Christians believe of Jesus coming back and changing the Earth, and so this picture that I got was of Jesus kind've dancing along with a bunch of people and the whole Earth kind've getting changed up and being made into what it is supposed to be. There's a lot of spiritual undertones in the song for me, in a general way. But, I guess, more generally it's just about how when our lives are kind've messed up, and the song was meant to carry this thing of hope. Things may look screwed up, but things will get better...you know what I mean?...the whistle [in the song]...just picture like a whole group of people like dancing around...it's like a Snow White and the Seven Dwarfs kind've thing, like going to work and seeing the whole Earth getting made better, and now we can kind've do that. I♥E/ Can you give us an update on a new album? JZ/ Well, we're recording it right now. Life is crazy for us, I mean I'm getting married tomorrow [June 1] and a bunch of stuff is going on; we're actually gonna be moving the headquarters to Victoria, even though we're gonna stay really connected to Edmonton. So the plan is to have at least an EP by mid-fall, and hopefully within a few months from then to have a full record. But we have a bunch of new songs that are finished up and recorded, and we're gonna hear sometime in the summer. 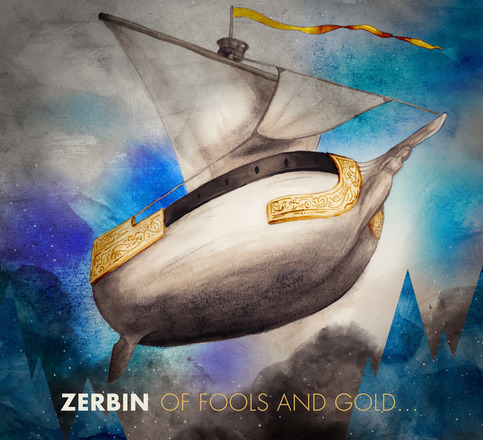 Below is the official video for Zerbin's "New Earth," which was recently named Single and Video of the Year at the 2012 Edmonton Music Awards. It was directed and produced by Matt Watt. 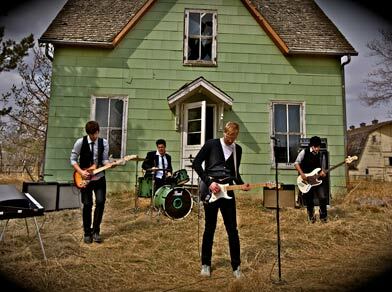 Amazing song and band, I would luv to see them play live, do you know when they are coming to Calgary?